Can an aspirin a day keep the psychiatrist away? Floating across my Facebook feed this morning was an article on the possible link between depression and inflammation. Its premise was that depression, the joyless soul-sucking disease affecting millions of people around the world, is related to inflammation. If that were true, might mean that we could cure depression with medications that stop inflammation. Maybe we should be consuming an aspirin a day to keep the doctor away, and not the proverbial apple? Inflammation is a hot topic right now. Inflammation in the medical sense refers to a normal body process to promote healing and recovery from sickness or injury. It’s a complex dance of chemical signals which is triggered by damage to tissue. Inflammation is essential to life. Without it, we would be unable to repair our tissues if they were damaged. When tissues are damaged, a number of local cells in the damaged area release pro-inflammatory cytokines which then trigger a cascade of responses; increase in the size of the local blood vessels to allow greater blood flow to the area, attracting pus-cells (neutrophils) to the area, and increasing the ‘leakiness’ of the blood vessels to allow the pus cells into the area. This response is governed by a number of chemical mediators throughout the body, including histamine, serotonin, complement system, kinins, substance P, prostaglandins and leukotrienes, cytokines and nitric oxide. Anti-inflammatory cytokines balance out the process, keeping the pro-inflammatory cytokines in check so that the process doesn’t spiral out of control. Despite the literal plethora of chemical reactions going on simultaneously, most of the time the reaction eventually runs out of noxious agents, the anti-inflammatory cytokines dampen down the reaction, and the tissue returns to either normal, or at least functional. Though inflammation isn’t just limited to repairing damage but also preparing for damage –psychological stress prepares the inflammation system for potential damage. Physical stress triggers the inflammation system to repair any damage. Chronic inflammation occurs when the acute illness or injury does not fully resolve and continues to smoulder, the natural healing pathway is obstructed, or the body remains in a psychological state in which it is always expecting a fight. In chronic inflammation, the processes of active inflammation, tissue destruction and attempts at healing occur simultaneously. In terms of cytokines, the anti-inflammatory cytokines can’t balance out the excess pro-inflammatory cytokines. There’s a theory about depression which is gaining momentum within the scientific community, that depression and a number of other psychiatric and neurodegenerative conditions are the result of chronic inflammation which occurs because of chronic stress. Remember when I said before that psychological stress readies the inflammatory system for potential damage? Well, what if that damage never comes? If there’s chronic psychological stress, the system is constantly being worn down, and never getting a chance to recover. This seems to make sense – chronic stress reduces new nerve cell production and growth, and may interfere with the action of nerve growth factors like BDNF and neurotransmitters like serotonin. Hence why this article by Feelguide seems to ring true. But is it true? Is depression fundamentally an inflammatory disease, and if so, can we treat it with medications that decrease inflammation, like aspirin? Let’s go through the various statements made in the Feelguide article and see what the medical evidence says. First, a necessary correction to avoid confusion. 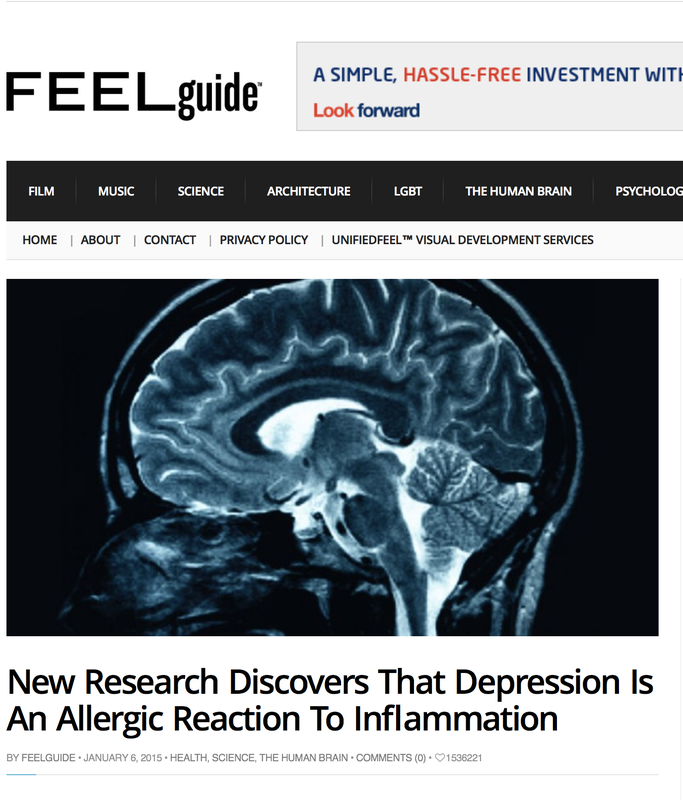 The Feelguide article says that, “New research is revealing that many cases of depression are caused by an allergic reaction to inflammation.” Depression is not an allergic reaction. A true allergy is an antibody response which releases a chemical called histamine from cells called mast cells. If the current theory about depression and inflammation is true, then depression is related to cytokines, chemicals that are entirely different to histamine. It may be really annoying to sneeze like you’re demon possessed if a cat’s been in the same room a week ago, but it’s not going to make you depressed. Is inflammation caused by obesity, high sugar diets, high quantities of trans fats, unhealthy diets in general? There’s limited evidence that the foods you eat result in inflammation. Most of the positive data comes from observational studies which are relatively weak. Better, stronger studies generally give conflicting information . For example, if high fat, sugary foods were really the cause of low grade inflammation, then diets like the Palaeolithic diet, which replace sugary, fatty processed foods with a bucket load of vegetables should improve inflammation. Yet there have been no statistically significant changes in inflammatory markers recorded in subjects following the Palaeolithic diet . The Feelguide article claims that, “By treating the inflammatory symptoms of depression – rather than the neurological ones – researchers and doctors are opening up an exciting new dimension in the fight against what has become a global epidemic”, but let’s not get too excited. Again, there’s precious little evidence that medications or supplements reported to reduce inflammation make any difference to depression. For example, the article mentions omega-3 and curcumin as having some benefit in the treatment of depression, which is half-right. There’s some evidentiary support that EPA-predominant omega-3 supplements may have some effect on depression, but none at all for DHA omega-3’s  or curcumin . When it comes to other medications with an anti-inflammatory effect, the results are similarly mixed. The issue seems to be the specific cellular action of the medication on a particular immune cell in the brain called the microglial cell. For example, normal anti-inflammatory medications like aspirin and other Non-Steroidal Anti-Inflammatory Drugs (NSAID’s) increased the activity of these special microglial cells which resulted in an increase in depressive symptoms in otherwise healthy individuals, whereas a medication called minocycline has been noted to decrease the activity of these microglia, and reduced the risk of depressive symptoms (in animal studies at least) . That’s really because we don’t know whether inflammation causes depression, or if depression causes inflammation. The article by Feelguide seem pretty confident, but the science is still a long way from being settled. 1. Depression is complicated and still poorly understood. 2. It may be related to inflammation, but please don’t rely on herbs or medications that claim to have anti-inflammatory or “immune boosting” properties. 3. If you really want to try and treat your depression without pharmaceutical medications, take some EPA Omega 3 supplements by all means, although I’d encourage you to exercise and engage with a good psychologist too, both of which have more evidence of benefit overall. Minihane AM, Vinoy S, Russell WR, et al. Low-grade inflammation, diet composition and health: current research evidence and its translation. The British journal of nutrition 2015 Oct 14;114(7):999-1012. Pitt CE. Cutting through the Paleo hype: The evidence for the Palaeolithic diet. Aust Fam Physician 2016 Jan-Feb;45(1):35-8. Hallahan B, Ryan T, Hibbeln JR, et al. Efficacy of omega-3 highly unsaturated fatty acids in the treatment of depression. The British journal of psychiatry : the journal of mental science 2016 Apr 21. Andrade C. A critical examination of studies on curcumin for depression. J Clin Psychiatry 2014 Oct;75(10):e1110-2. Brites D, Fernandes A. Neuroinflammation and Depression: Microglia Activation, Extracellular Microvesicles and microRNA Dysregulation. Front Cell Neurosci 2015;9:476. This entry was posted in Biological, Psychological and tagged allergy, aspirin, BDNF, cytokines, depression, diet, feelguide, immune, inflammation, neurotransmitter, NSAID, obesity, palaeolithic, psychiatric, sugar by cedwardpitt. Bookmark the permalink.